The struggle is real when it comes to packing lunches sometimes. What do you pack? What will they eat? Above all else, you can’t forget to pack it. And this year, we were placed in the peanut-free room, so we have to be extra cautious what we pack. This year, I tried to get ahead of the game by thinking a little more positively about packing lunches. First off, I splurged on a stainless steel compartment lunch box and we love it. It makes packing really easy, and washes out really well. My daughter Reagan loves to eat and really looks forward to her lunch each day at school, so I thought what better way to make things easier on me and to help her get involved than to let her help me pack it? And wow, she is loving it. We also try to pack a healthy lunch each day. So she will get to pick if she wants grapes, strawberries, carrots, etc., and pack those for the next day. She also gets to pick a snack for lunch, too — maybe pretzels, a healthy bar (we love Kids Clif Bars), and maybe a cheese stick or something small. I’ll usually do the sandwich, but it’s so fun to do it together. After she’s done her part, I try to remember to slip something special in the lunch: a little note with love. 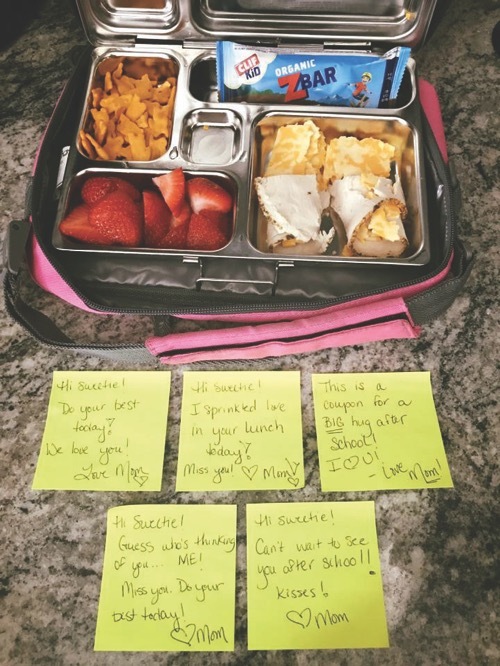 A couple times, I forgot to put a note in my daughter’s lunch and she came to me one day after school and said, “Mom, can you please put one of those love notes in my lunch box everyday? I just love that.” Totally melted my heart. Now I’m not gonna promise I’ll remember every day, but boy, I’m going to try. I didn’t realize how much it meant to her. Moving forward, I’m prepping little notes of love ahead for the week. I write out five notes on Sunday evenings and keep them handy so I can just grab them and put them in her lunch. It’s the little things, right? I shared this story on my Facebook page and loved how so many people shared how much their “love notes” from their mom or dad meant so much to them. Some of them even told me that they’ve saved them for more than 30 years. You can find tons of love note ideas on Pinterest if you need a little inspiration. I’m treasuring all the moments with my girls and hoping they remember some of these sprinkles of love when they’re older — and maybe pass on the tradition to their kids, too.